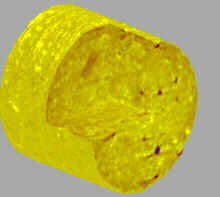 Computer tomography, initially implemented in the medical field, today is also used in materials research. Moreover the technology has been improved by implementing the microfocus X-ray sources in the computer tomography facilities. In microfocus computer tomography (mCT) the resolution of a system can be in the order of 10 mm x10 mm x10 mm depending on the object size, which is much better compared to the typical 60 mm x 60 mm x 1 mm resolution of the medical CT. The resolution of the two microfocus computer tomography systems available at the Department of Metallurgy and Materials Engineering (K.U. Leuven), being the desktop SkyScan 1072 computerised microtomograph (for small objects up to 4 cm3) and the AEA Tomohawk CT system on the Philips HOMX 161 microfocus system (for large objects up to 5 kg), is indicated in Table 1. Table 1:	Achievable resolution with the microfocus CT equipments available at the K.U. Leuven for different object sizes. In this paper the usefulness of the mCT in different fields of material science is discussed with emphasis on sedimentary geology, research on bone remodelling around biomedical implants, research on light weight metal foams and electronic components. The various examples illustrate how mCT can be used quantitatively to investigate the microstructure and the behaviour of micro-heterogeneous structural materials. The vast number of examples also reflects the multidisciplinary use of the equipment and indicates how progress in one field can be beneficial to the other. Before this discussion some techniques will be presented to improve the image quality and to minimise artifacts. Optimising techniques to enhance mCT images and to reduce artifacts. If some internal feature of a material needs to be determined accurately in size or the material needs to be characterised based on density measurements for instance, artifacts in the reconstruction of a CT image must be avoided or minimised. 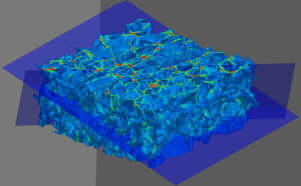 Microfocus computer tomography in sedimetary geology. Current research of mCT in geological sciences focuses on the characterisation of reservoir rocks (Tricart et al., 2000; Van Geet et al., 2000a) like sandstones, carbonates and coal. The most important advantage of the mCT is the possibility of 3D visualisation and quantification of porosity and mineralogical pore-relating phases. Classical geological studies are based on 2D light microscopy techniques on thin sections and polished surfaces. 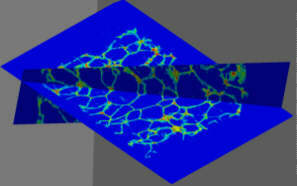 To validate the mCT-data, 2D slices will be correlated with other 2D classical techniques, like light microscopy and scatter electron microscopy. Such a correlation is currently worked out for coal samples (Van Geet et al., 2000b) and will be performed on classical sand and carbonate reservoirs and on igneous rocks. To perform such correlations, however, an optimisation of the image quality was originally the most important research topic. In this respect two artifacts mostly degrade the image quality of reservoir rocks. The first one is a star artifact caused by secondary radiation. This artifact is especially related to high attenuating materials and consequently important for studies on sedimentary rocks with iron-containing minerals (pyrite). The second artifact is beam hardening, which is again most pronounced in high attenuating materials like quartz, carbonates and iron containing minerals. 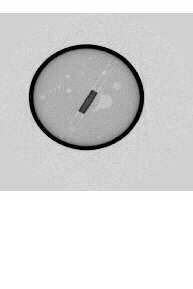 The artifacts are reduced by placing metal foils in front of the detector system, which cut off the lower X-ray energies that cause the artifacts (Van Geet et al., 2000a). Once a good image quality is realised, characterisation of the different mineral phases can be carried out. However, the linear attenuation coefficient of mineral phases is a poorly known parameter. As the latter depends mainly on the density and the atomic number of the studied object and the used X-ray energy, a dual energy technique is worked out (Alvarez and Mackovski, 1975; Coenen and Maas, 1994; Van Geet et al., 2000a). Here, the same sample is scanned at two different energy levels and, after a calibration procedure, the density and atomic number information of the internal features on voxel level can be extracted. The data of the density measurements are the most reliable, because this information is incorporated in the high energy photons, which have a higher flux when using metal foils as filters. Figure 1 shows the correlation between the real density of some calibration samples and the linear attenuation coefficient at two different energies. Figure 2 shows the enhanced correlation by using the dual energy technique. The density is obviously easier to interpret since it corresponds to parameters often used in petrophysical research. Fig 1: Plot of density versus linear attenuation coefficient for 15 calibration materials at two different energies. Fig 2: Plot of density versus measured density by means of dual energy for 15 calibration materials. Further research on the use of mCT will be focused on the characterisation of fractured reservoirs, which involves a 3D quantification of fracture sizes and orientation. Other research topics will focus on dynamic processes. Firstly, it will focus on a two component system, namely free water uptake measurements, which enable the visualisation and quantification of moisture content profiles of several materials. Subsequently, a three component system can be analysed, like enhanced oil recovery, in which oil displacement by means of different gases or fluids is tested. Some examples are given here, which illustrate the usefulness of a three-dimensional visualisation of geological samples. Other examples can be found in Van Geet et al. (2000a). A first example (figure 3) shows a porous carbonate of 8 mm in diameter. 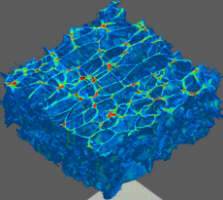 At this magnification, a voxel size of about 22 mm in three dimensions is achieved. The carbonate is build up of oolites and fossils, especially shell material. The shell material is now dissolved and represents a secondary pore. Oolites are small spherical carbonate parts. Here they have been dissolved and cause the high porosity. The pores are clearly visualised by their white colour, which represents the attenuation of air. Fig 3: 3D reconstruction through an oolitic limestone that clearly shows the porosity (white colour) of the oolites and shell material. Fig 4: Oolitic carbonate sample with about 20% bulk volume porosity. Some oolites are now filled with barite (blue colour) and the sample also shows a gypsum crystal (arrow). A second example (figure 4) shows another oolitic reservoir rock, which shows some precipitates within the pores. The dual energy technique has been used to discriminate several minerals and to estimate the porosity of the sample. A gypsum crystal (arrow), barite precipitates (blue colour) and carbonate were found and the porosity was estimated at about 20% (Van Geet et al., 2000). Microfocus computer tomography for research on bone remodelling around biomedical implants. 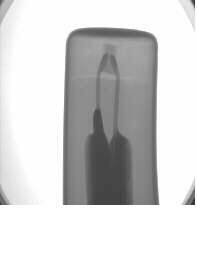 In this way the stress transfer between implant and bone can be analysed on a microstructural level. The validation of the FE models can then be carried out as well: the measured displacements in a mechanical test on a scanned specimen have to be compared with the displacements calculated via a finite element model of the same specimen and the same loading. The accuracy of the finite element modelling can therefrom be retrieved and this approach opens the possibility to simulate numerically biological mechanisms like adaptive bone remodelling. Microfocus computer tomography of aluminium foams and electronic components. Metallic foams are porous metals with high porosity (from 50 to 99 %). In the past few years the interest in metal foams, especially made of aluminium or aluminium alloys, has increased considerably. The unique properties of aluminium foams like high stiffness to weight ratio, high energy dissipation, low density, reduced acoustic, thermal and electrical conductivity, chemical resistance, easy recycling etc..., make them potentially useful in many high technology industries such as automotive and aerospace. 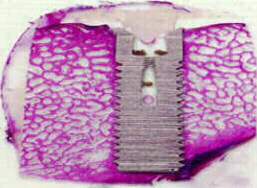 The mCT provides images of the internal details of Al-foams without special specimen preparation. Figure 9 shows mCT images of Al-foam samples made by a casting process. The pictures reveal a broad density distribution through the samples. One can also distinguish that the cells are oriented in a preferred direction and that there is a broad cell size distribution. 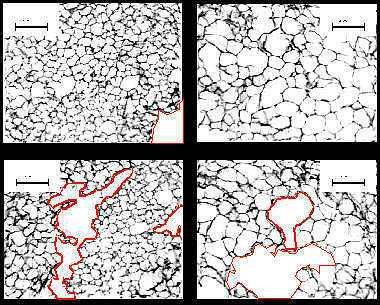 Fig 9: mCT images of cross-sections of Al-foams made by casting process; (a) sample with average density of 0.10 g/cm3, (b) sample with average density of 0.18 g/cm3, (c) sample with average density of 0.31 g/cm3. Fig 10: mCT images of cross-sections of Al-foams made by a powder metallurgy process showing the presence of big holes in the foam structure: (a) sample with average density of 0.35 g/cm3, (b) sample with average density of 0.22 g/cm3. mCT images of Al-foam samples made by the powder metallurgical route are given in figure 10. The samples have an average density of resp; 0.22 and 0.35 g/cm3. Two slices at two different heights have been extracted for each sample. The cell size distribution seems to be homogeneous but the presence of big holes around the centre of the structure leads to a broad density distribution through the specimens. These holes might be caused by the foaming process itself because the latter is stopped by simply allowing the mould to cool. The temperature in the centre of this mould is still sufficiently high to enabling the foaming process to continue while it has stopped elsewhere. 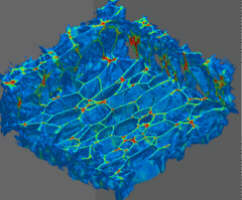 Microfocus computed tomography provides 3D information of the scanned specimen concerning cell arrangement like orientation, gradient, homogeneity, etc.. Images of contiguous planes can be stacked by mean of a reconstruction algorithm to form 3D images of a section or if the entire part has been scanned, a full volumetric image of the specimen (figures 11). Fig 11: 3D reconstruction of an Al-foam structure produced by casting process based on 50 CT slices with a numerical cut-out. Once the data are imported, the reconstruction algorithm can quickly generate slices in any orthogonal plane or at oblique angles through the 3D data volume as well as creating cut-outs in the reconstructed 3D foam structure (figures 12). 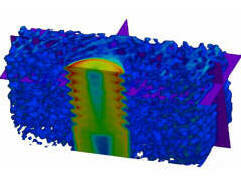 Fig 12: Numerical oblique slices through the 3D data volume of an Al-foam structure produced by powder metallurgy process. Further image processing can create binary images which can be used for quantitative measurements. Some results based on the binary image of figure 13b are presented in figure 14 and 15. A temperature sensor for a laundry washing machine needs to work reliable. Therefore the polymer which encapsulates the sensing device needs to be void/porosity free. 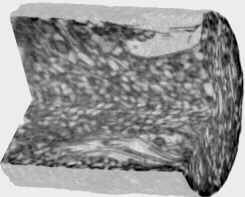 Using only X-ray projection radiography to reveal those is very hard (figure 16), taking 2D slices of this component in the sensing area leads to a clear identification and even reveals the distribution of the voids over the cross section. Based on this information even temperature profiles can be pre-calculated (prior to production) or back-calculated (in case of failure). Fig 14: Histogram of the cell area of the Al-foam slice of figure 14b. 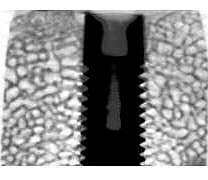 Fig 16: X-ray projection radiograph of temperature sensor Fig 17: 2D computer tomography slice at the top of the temperature sensor. Fig 15: Histogram of the equivalent diameter of the Al-foam slice of figure 14b. This paper discusses the possibilities of microfocus computer tomography in materials research. In this large interdisciplinary field not only high quality 2D and 3D images of the internal structure of the material can be obtained but with intelligent processing of the data even quantitative information. Several attempts in this direction have been pointed out and are subject of present research projects within the Katholieke Universiteit Leuven. The fund for Scientific Research (FWO) in Flanders (project number G.027.97) and the Flemish Institute for Scientific Reseach and Technology (project number IWT 950330) are acknowledged for the financial support of this research. Skyscan, 1977, Skyscan 1072 Desktop Microscope-microtomograph: instruction manual. Skyscan, Aartselaar, 43 pp. Burch, S.F., Ramsay, A;T., Whittaker, J., 1998, Tomohawk user manual for Leuven University: a user manual produced for Leuven University, Belgium, AEA Technology, OXON, 89 pp. Van Geet, M., Swennen, R. and David, P., 2000b. Quantitative coal characterisation by means of microfocus X-ray computer tomography (mCT), colour image analysis (CIA) and back scattered electron microscopy (BSE). International Journal of Coal Geology, submitted. A.-H. Benouali, L. Froyen, M. Wevers, Microfocus computed tomography of Aluminium foams, in X-ray Tomography in Materials Science, Chapitre 10, ed. J. Baruchel et al., Hermes Science Publications, Paris 2000, ISBN 2-7462-0115-1, pp. 139-153.